JS-5.3 Swinging-Bucket Rotor, Anodized Aluminum. Four-place rotor with anodized aluminum buckets designed for use with adapters to accommodate a wide range of tubes and bottles. 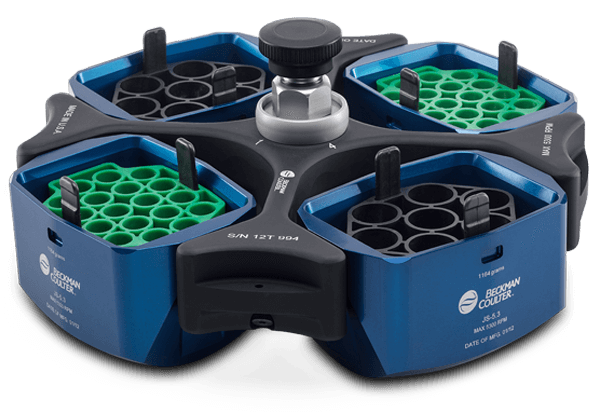 Rotor buckets are interchangeable with microplate carriers. Includes tie-down knob. Major applications: Rapid sedimentation of protein precipitates, large particles, cells, and cell debris. It can be used for binding studies and separating serum from whole blood. For use in Avanti J-E and J-26 XP Series centrifuges only.